Please find below some horse laying betting systems and tools that you should check out right away if you are serious about making money from losing horses! Laying or Lay to Lose betting is a fairly new option for bettors since the introduction of the betting exchanges like Betfair, Betdaq etc. A Lay bet is simply a bet that a selection will lose. Laying is often seen as a complicated and unprofitable option but the reality is that they are very simple to understand and liabilities can be kept to a minimum with a sensible approach. For further information on lay betting take a look at my lay to lose horse betting article. The lay systems, methods and tools listed here are examples of such approaches and are worth a good look if you are wishing to add lay betting to your portfolio. Another important benefit of lay betting is that due to the fact that the bets are placed on betting exchanges, your profits are not limited by potential account closures unlike if you are successful with bookies! Laying horse to lose can be a great approach in races with large fields (over 15 runners). Most people can usually find a few horses in these races that are very unlikely to run well and therefore they can be great lay bets on both the win and place markets, assuming the lay price is low enough to be offering value. Remember every horse has a price and if you start laying outsiders at huge odds above their true price of winning, then you will end up losing money! The price is always the key factor. 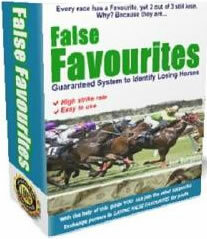 BetFair accredited trainer 'Jonathan Burgess', spills the beans on his system of Laying False Favourites. I like the fact that he does not promise the Earth with rediculous claims of winnings, but demonstrates how long term steady profits are achievable by laying certain favourites. This ebook is vast at over 200 pages long but as such covers everything you need to know about laying horses in great detail. It really is the 'bible' of horse laying books and whether you follow it to the letter or pick out key elements, you are sure to find the information very useful. Sure, some of the book will be covering old ground for the regular bettor, but this can simply be skipped over. The novice layer will find the content valuable throughout. Although, I haven't yet personally followed the system in full and therefore verified the results, I have located many independent reviews which on the whole are glowing and very positive. Results are posted on his site for you to review. They make a good read !!! At an Incredible Price of ONLY £26.99 this is a real bargain not to be missed. If you promote a 'Good Quality' horse laying system or method that you feel would benefit my visitors and would like to discuss affiliate options, please contact us with your proposal / details.